Home Learn About Cheese Cheese Musings & Tips The Courtyard Dairy’s New Venture…. 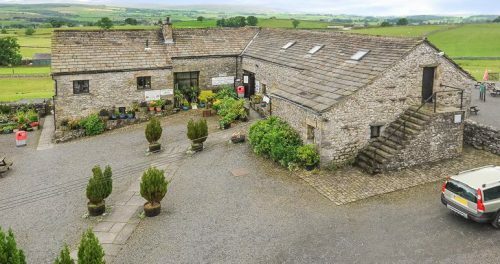 No doubt a few of you will know already about The Courtyard Dairy’s purchase of the former Yorkshire Dales Falconry Centre on the A65 near Settle. The plan is for Kathy, Andy and their two lovely children to live there, consolidate the business and eventually move all the operation there. Four years ago, after time spent working with cheese in France, Bath and London, Kathy and Andy moved to Settle to open their own small cheese shop: The Courtyard Dairy. 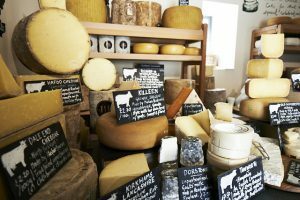 They wanted to run a shop that focused exclusively on quality and traditional farm-made cheese. Since then, Andy and Kathy have been overwhelmed by the support they have received from the people of Settle and throughout Craven. This amazing support has enabled them to make a quantum leap in order to grow their business and create a more secure future within Settle. Andy and Kathy love Settle and its residents, and they want to continue to live and bring up their young family in the area. The larger space available to them at the former Yorkshire Dales Falconry Centre will allow several improvements to their business: increase the space for storing and further maturing cheese to make it truly special, incorporate a small information area showcasing information about cheese-making and its history in the Dales, open a cheese-themed café, and incorporate a cheese-making room. The cheese-making room will initially be used to run cheese-making courses and work as a development room for when Andy and Kathy advise and work with dairy farmers, but the five-year plan is to find a budding cheese-maker to establish themselves there. The new development will, of course, include a The Courtyard Dairy’s award-winning shop (a slightly-larger version), as dedicated as ever to providing the very best of unpasteurised farm-made British (and European) cheese. The plan is to have most of what’s described above open in the former Falconry Centre by the summer. But don’t worry, until the move of the shop is ready to go ahead, The Courtyard Dairy’s existing shop at The Courtyard will remain fully open for business as usual. 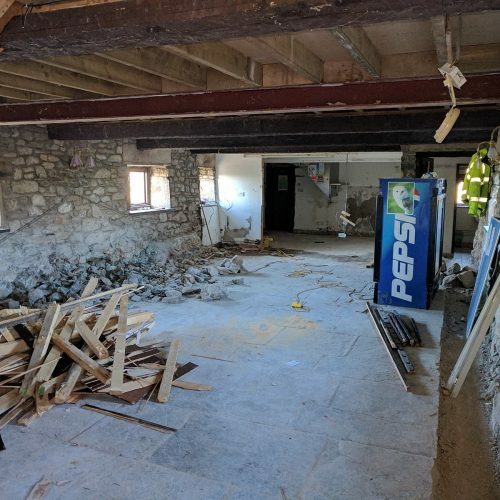 Hopley’s Building Contractors are working closely with architect Peter Harrison to remove the internal stairs and reposition them, as well as installing a lift. This will help open up the ground floor to allow space for the new shop. They are currently laying the resin cheese-room floor and installing a new door, re-using the 1740-dated stone lintel from elsewhere in the building. Andy and Sam are working hard tidying up the outside spaces and coming up with ideas and copy for the cheese information area, and dealing with the issue of trying to find a solution to the shortage of electrical supply, and trying to work out the best refrigeration solution with thanks from Alan Hayes at Capital. The projected open date is planned still for mid-June – July but is building permitted! 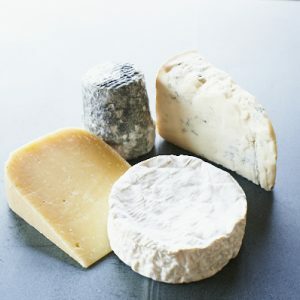 If you want to learn how to make your own cheese, the best place to start may be a cheese-making course, of which there are many throughout the UK.